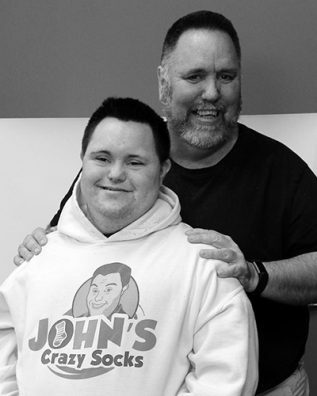 John’s Crazy Socks is a father-son venture inspired by co-founder John Lee Cronin, a young man with Down syndrome. John’s affinity for crazy socks paired with his love of making people smile made our mission clear: we want to spread happiness. They have a social mission and a retail mission, and they are indivisible. They want to show what is possible when you give someone a chance. Every day, they demonstrate what people with differing abilities can do. And they believe in giving back: donating 5 percent of our earnings to the Special Olympics as they’ve played a vital role in John’s development. They continue to expand our charity partners by offering and creating socks with specific “awareness” themes, such as our Autism Awareness Socks and Down Syndrome Awareness Socks. John’s Crazy Socks match their social mission with a commitment to be a great sock store. They have socks you can love with the widest array of fun, unique and beautifully designed socks that let you express your passion and personality. And they deliver those socks with fast, personal service. They provide same-day shipping and every package includes a hand-written thank you note from John and some candy. They love what they do and they hope you love our socks and that your experience with John’s Crazy Socks brings you happiness.